This tour includes airfare (departing from Chicago), hotel accomodations, entrance fees at all sites, breakfast and dinner and a deluxe motor coach. 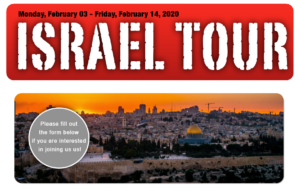 The cost for the 2020 Tour is $3795.00 per person based on double occupancy, and the Ground Only price is estimated to be $2,595.00. A single room is available for an additional expense. A deposit of $500.00 per person is necessary to hold your spot. Contact Pastor Jeremy at Jeremy.CalvaryCC@gmail.com.